THE Joint National Convention of Central Trade Unions and Industrial Federations held in Mavalankar Hall in Delhi on March 30, 2016 called upon the working class of the country to observe a country wide general strike on September 2, 2016 against the anti-people, anti-national and anti-worker policies of the NDA government. Hundreds of workers from all over the country employed in the organised and unorganised sectors, public and private sectors – from public sector undertakings, banks, insurance, defence, state and central government departments, railways, telecom, port and dock, road transport, electricity, construction, different schemes of the government of India, home based workers, domestic workers and from many other sectors participated in the Convention. The Convention strongly criticised the NDA government for its total apathy towards the genuine demands that were being continuously raised by the united trade union movement through their 12 point charter of demands. The government’s practice of bypassing the parliament and implement pro-management measures through executive orders was seriously condemned by the Convention. It strongly criticised the government for totally ignoring the consensus recommendations of the Indian Labour Conference related to minimum wages, contract workers and scheme workers. The Convention unanimously adopted resolutions condemning the Haryana government which has introduced Rajasthan type amendments to the labour laws, against the brutal lathi charge on the Honda workers in Rajasthan, against the labour law violations by the MNCs and in solidarity with the Pricol workers in Tamil Nadu and Maruti workers in Haryana. The Convention called upon the working class to observe country wide general strike on September 2, 2016 and start massive joint preparations at once to ensure that the participation of workers in the strike surpass even that in the general strike last year on the same day. It called upon the working class to take the unity attained at the national level to the grass root and work place level and also extend the unity to all other toiling sections of the society like the peasants, agricultural workers etc. The Convention was presided by Amit Yadav (INTUC), Amarjeet Kaur (AITUC) Raja Sreedhar (HMS), A K Padmanabhan(CITU), Satyavan Singh (AIUTUC), Sanjana (SEWA), Santosh Ray (AICCTU), Shatrujeet Singh (UTUC) and Mohan Kumar (LPF). G Sanjeeva Reddy from INTUC, Gurudas Dasgupta from AITUC, Harbhajan Singh Siddu from HMS, Tapan Sen from CITU, Sankar Saha from AIUTUC, Lata Yadav from SEWA, Santosh Rai from AICCTU, Abani Roy from UTUC and Subbaraman from LPF addressed the Convention. BMS which was party to the decision for the National Convention on March 30, 2016, did not participate. THIS National Convention of Workers organised by the Joint Platform of the Central Trade Unions (CTU) of the country along with independent national federations of employees of different industries and services congratulates the workers for the resounding historical success of the strike on September 2, 2015 and also for their huge participation in the countrywide National Protest Day on March 10, 2016. This massive unity of the working people in the joint actions has to be further widened and strengthened in the process of struggle against the anti-worker, anti-people policies of governments. The Convention notes that attitude of the government is profoundly negative and hugely challenging to the working class. Despite readiness expressed by the CTUs through joint letter to the government after the September 2, 2015 strike for commencement of dialogue on the 12 point charter of demands (CoD), the government did not respond at all thus arrogantly ignoring the message of such a huge strike by crores of workers pressing for their demands unanimously formulated by all the CTUs. The issues in the CoD relate to basic interest of the country's economy and also issues concerning the livelihood of the toiling people of both organised and unorganised sectors including the scheme workers. The government has not taken any meaningful step to curb price rise of essential necessities and to generate employment except making tall baseless claims through sound-bites in the media. Instead of universalising public distribution system, the government is trying to scuttle it through the inherently anti-poor targeting mechanism called 'Direct Benefit Transfer' resulting in further exclusion of the common and needy people. The huge dose of additional duty on diesel, doubling of cess on coal, and increase in indirect taxes in the latest budget (2016-17) and the recent increase in prices of all petro products are bound to fuel further spiraling rise in prices of daily necessities. The government is mysteriously silent on the question of retrieving the black-money stashed abroad. This government is equally unconcerned on recovering the Rs 4.04 lakh crore of bad debts, euphemistically called non-performing assets (NPA) of public sector banks and almost similar amount on account of unpaid direct tax. Rather in the union budget, it allowed further relaxations to both loan defaulters and tax-defaulters. And at the same time, the common and marginal people are being strangulated through huge increase in the burden of indirect tax and cut in allocations on social sectors etc. Whole range of social security measures are under severe attack. The EPF and the ESI schemes are proposed to be made optional by the government to pave the way for their ultimate demolition. Post 2004 entrants in government services, defence, railways etc have been subjected to notorious new pension scheme. And for the vast unorganised sector workers, old schemes are being repackaged and renamed, without providing for funds and implementation-machinery to just befool the people. Although the government had to roll back their retrograde budget proposal to tax the EPF withdrawal, they have launched atrocious attack of drastic cut in interest rate on small savings instruments like PPF, Postal saving deposits, Girl Child savings scheme, Sukanya Samridhhi Yojana, Kisan Vikas Patra, National Savings Certificate and even senior citizens' deposit schemes and monthly income scheme. This retrograde move would hit the common and marginal people very hard, more particularly those living on interest income only after retirement. Totally ignoring the united opposition of the workers, the government has been moving fast to demolish existing labour laws thereby empowering the employers with unfettered rights to "hire and fire" and stripping the workers and trade unions of all their rights and protection provided in laws. As follow up to the PMO's written communication to the chief secretaries of states, state governments are being directed to carry out Rajasthan type pro-management amendments in labour laws. The labour secretary, government of India has issued executive order on this January 12, granting exemption to so-called Start-up Enterprises from inspection and application of nine major labor laws, thereby legitimising violations. The proposed Small Factories (Regulations of Service conditions) Bill prescribes that major 14 labour laws will not apply to factories employing up to 40 workers. Labour Code on Wages Bill and Labour Code on Industrial Relations Bill under the cover of amalgamation, seek to make registration of unions almost impossible, making retrenchment and closure almost free for the employers class. These bills have been put in public domain totally ignoring the trade unions thereby violating the provisions of ILO Convention 144 on Tripartite Consultation. All these amendments are meant to exclude 90 percent of the workforce from application of labour laws thereby allowing the employers to further squeeze and exploit the workers. All rights-components in all the labour laws are being demolished to impose conditions of slavery on the working people. Simultaneously, almost in all the states, the work-place level struggles of the workers are being sought to be crushed through repression including intimidation and arrests by the government machinery as is being nakedly visible in Rajasthan, Haryana, Tamilnadu, Andhra Pradesh, Gujarat etc in recent times. Along with the working class, the peasantry and agri labourers are also under severe attack. Through sweeping changes in the Land Acquisition Act, farmers' right to land and agri-workers' right to livelihood were sought to be drastically curbed, which ultimately could be stalled temporarily through popular struggles but the danger still remains. Attack on public sector has been pushed to unprecedented height. Not merely disinvestment, the government will now go for 'mega strategic sale'. The main target is the Maharatna CPSUs and those amongst the top profit making CPSUs including banks/insurance. The ownership control and management of our shinning CPSUs are being sought to be handed over to the private corporates, both domestic and foreign. Along with, almost unlimited FDI is allowed in strategic sectors like railways, defence and financial sector as complementary to the move of privatisation/PPP etc. The anti-worker and authoritarian attitude of the government is also nakedly reflected in their refusal to implement the consensus recommendations of 43rd, 44th and 45th Indian Labour Conferences on formulation of minimum wages, same wage and benefits as regular workers for the contract workers and granting status of workers with attendant benefits to the scheme workers like anganwadi, mid-day-meal, ASHA, para-teachers etc. On the contrary, the government drastically curtailed budget allocations to all those centrally sponsored schemes meant for poor peoples' welfare. The legislation on the issue of Street Vendors is not being implemented appropriately. 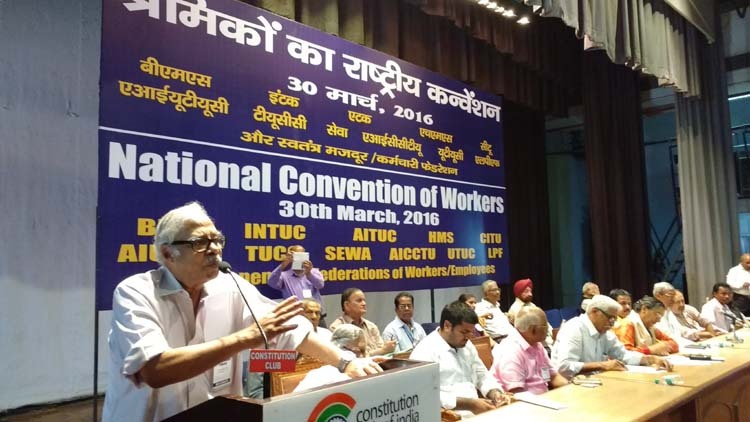 The Convention reiterates the demand for strict implementation of labour laws and a total scrap of its proposals of so-called "labour law reforms", halting mass scale unlawful contractorisation, minimum wages at not less than Rs 18000 per month with indexation and universal social security benefits and pension for all including the unorganised sector workers, etc. The demands also include compulsory registration of trade unions within 45 days and ratification of ILO Conventions 87 and 98. The Convention urges the government to reverse the direction of the ongoing economic policy regime which has landed the entire national economy in distress and decline affecting the working people the most. The Convention also extends support to the struggles of the government employees, railways and defence sector employees, bank and insurance employees, coal, telecom and transport sector employees etc on their just demands and against the policy regime. The Convention once again expresses its readiness for arriving at an acceptable settlement to the 12 point Charter of Demands through discussion with the government. Effective implementation forthwith the consensus recommendations of successive Indian Labour Conferences on minimum wage, on contract workers and the scheme workers is crucial for the CTUs to prepare for dialogue with the government. The National Convention of Workers calls upon the trade unions and working people irrespective of affiliations to unite and make the countrywide general strike a massive success. Unity of working people and masses has to be defended and strengthened through the process of struggles only. The Convention also appeals to the peasants, agricultural labour and the rural and urban toiling people to support and participate in the strike on September 2, 2016.